The other day someone asked what my plans are for Purim. I think, like every other parent of food-allergic children, my heart skipped a beat and sunk to my feet. Not this time of year again! 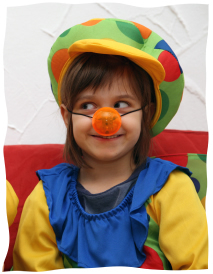 Purim should be filled with fun, excitement, and laughs, but for a family dealing with food allergies, it’s pure fear. If we go to the Megillah reading, what nosh will be around? What will be in the mishloach manot (food baskets) that people send us? Will anyone bother to even send them to us? What do we do about the Purim seudah (festive meal)? Do we go to the community event or stay home once again? How do I make it so my children can feel the excitement and fun of the Purim holiday and not feel left out and depressed? My son was allergic to wheat and anaphylactic to eggsThree weeks before my middle son’s first Purim (four years ago), we learned that he was allergic to wheat and anaphylactic to eggs (this means a potentially deadly reaction if not immediately treated). At the time, we were still waiting to find out the extent of his food allergies. We knew of these two because he had eaten one of his older brother’s pancakes and had his first anaphylactic reaction. So, only weeks away from Purim and not fully understanding what was okay and what was not, we realized this was going to be a hard holiday. Between doctor appointments and packing for our move to a new house, I accepted a friend’s invitation for the Purim meal. Purim night came and at the Megillah reading, I noticed my son become more and more blotchy, and soon he was breaking out in hives. Who knew what he was reacting to, but that ended the night pretty quickly. The next day, as the mishloach manot started arriving, my tears poured harder and harder as I realized that none of the Purim treats were safe. Only days before, our allergist had restricted us from all of the top eight allergens (wheat, egg, peanut, tree nuts, shellfish, fish, soy and dairy). It didn’t leave us with much to eat, but it was just enough to get by, as long as I was cooking. At the Purim meal, I felt left out and anything but joyous. As a nursing mother, I too was on a total elimination diet from all his allergens and suspected allergens. This meant that I couldn’t eat any of the food, and food is so much a part of this holiday. I decided then and there that the next year we would make the meal at home, as I wanted my son to get to be a part of the experience. His list of allergens had already grown from the year before to almost twenty fully diagnosed food allergies. We would start new traditions. So when the next year came, at the Megillah reading, we sat outside and watched as everyone enjoyed the festivities. I had brought his safe cookies for him to eat, but as I looked at his face, I saw tears rolling down his cheeks. He knew he was missing out. The next day he refused to go with his father to deliver the Purim baskets, and even though we offered him as many of his safe cookies as he wanted, all he really wanted was his big brother’s hamantash. He had handmade chocolates, gluten-free hamantashen, and boxes of apple juiceThat year, most people did not bother sending us mishloach manot, and let me know they just didn’t know what was safe. That’s when I got my bright idea to spend the coming year perfecting a mishloach manot that was safe for his allergens, and one that he could share with the community. It would bring awareness to other people and excitement for him. By my son’s third Purim, his baby sister joined him in the food allergy world. By then we were pros at this. Though she threw us some challenges by being anaphylactic to foods like chicken and chocolate, I was still determined to make my son’s Purim the best ever. My son got all dressed for the Megillah reading, and with a beaming smile, grabbed his bag of goodies to share with his friends. He had handmade chocolates, gluten-free hamantashen, and boxes of apple juice. He also made his own gragger (noisemaker) out of materials that were latex-free and safe for him to touch, as the synagogue ones would be covered with his allergens. His smile during the Megillah reading was infectious! He shook his gragger harder than I have ever seen, as if he was making up for the past years. And the best part of it, when it came time for everyone to be eating and having a grand old party, he chose to stay with his baby sister and make her laugh so that she would not feel left out. The next day, he proudly delivered his mishloach manot to everyone in the community. It contained a message explaining food allergies, and how he had taken his own pushka money (the money from his charity box) and had given it as a donation in the name of his community to an online support group I am a part of, consisting mainly of Jewish families. It is through them I got the strength to continue, and to make events like Purim as special as they would be if we didn’t have food allergies. That year, also, we didn’t really get any mishloach manot. But it didn’t matter, as we had found a way to make it exciting again. We realized it’s not really about the food, but about how we go mentally into the holiday. Last year we went into the holiday feeling completely joyous, and the holiday was truly a happy one. So now, here we are again. Purim is around the corner. This year, my son has been counting down the days. My kids are constantly dancing and singing on top of their lungs, “Mishenichnas Adar, Marbim B’Simcha!”—when Adar comes in, we increase in our joy. He has his costume picked out, and he has been telling me all the different things he wants to put in his mishloach manot this year. We are going to do our utmost to passionately enjoy this Purim! Fortunately, he and his sister have outgrown many of their allergies. We have gained wheat back, which means that they can finally eat challah. This will also be the first year they can have grape juice on Purim. We have gone from a total of forty-plus allergens down to less than twenty between the two of them. There is no question that the extra work needed to make Purim safe for them is completely worth it, when I see their eyes light up and their love for Judaism grow. We will still have the epi-pens (the injection given in case of an anaphylactic reaction) in our hip packs and plenty of Benadryl on us. The fear that someone our children trust will give them something to eat to which that they are allergic is still there. But we are going to do our utmost to passionately enjoy this Purim! I bought the kids chicken costumes this year and will make a sign that says, “I am anaphylactic to eggs, so please don’t feed me any food without my mommy’s permission!” That fear will never go away as long as the kids are still allergic. But the fear that they will be turned off from Judaism because the celebrations have only brought them heartache is gone, and because of that, my heart skips a few less beats and doesn’t sink as far into my feet when I hear it’s Purim time once again. Here are some of the recipes I have used for the traditional Purim foods. They are allergy-free and absolutely delicious! Melt the stick of margarine with the chocolate. Coat sides and bottom of mold with chocolate and then stick in freezer for 10 minutes. Fill with SunButter and then top off with more chocolate till it’s filled to the top. Put back in freezer to finish setting. Make sugar cookie mix, but use half the amount of margarine, and instead of non-dairy creamer, use orange juice. Make into balls and flatten out in hand. Put filling in the middle and fold over sides to make triangle. Bake. Put yeast, ¾ cup water, and sugar together till it bubbles. Mix dry and wet ingredients, except the rest of the water. Slowly add the water in until it’s the right consistency, if it is too dry. Mix cake mix with soda pop. (Change the type of soda pop depending on the flavor: e.g., if you do chocolate use Coke, and for vanilla use either ginger ale or Sprite.) Put into cake pan or cupcake tins and bake until it is cooked through. It usually takes the longer of the times written on the box. Mix dough and put in a plastic wrap to sit. Dice onion and cook in oil till clear. Add meat and brown, then add the zucchini. Add spice to taste. Roll out dough and cut squares. Fill, wet edges, and than fold into a triangle and seal closed. Either boil: let boil till they float and then give them five minutes; serve in soup. Or fry: fry on both sides with a bit of oil till browning; great to dip in honey. Sara Atkins is a stay-at-home mom her five silly and special children in Wynnewood, PA. In her spare time she is the President of Angel Service Dogs, Inc which is a foundation which trains Allergy Alert (TM) Service Dogs and Service Dogs for other needs including Tourettes Syndrome, PTSD, and anxiety. Any chance we could have the pattern for the chicken costume? I really admire your courage and tenacity!! I've only got 1 with a peanut allergy but it keeps me on my feet. Now my niece with a macadamia allergy ... but this is easy. I am the one with the gluten and dairy challenges. Nonetheless, perhaps it's Mom who needs the chicken costume this year!! Have a lovely Purim. kosher with food allergies What a great article with wonderful recipes and tips. Chemical Allergies There is some help out there. Look for a person in your area who uses a Bioset machine and some practioners are able to build you immune system. I became allergy to foods and chemicals last July. It is a very slow process, but I am hardlly having an asthma attack. It is a very isolating experience and what hurts most if the reaction from people you love the most and how judgemental they are, as if you are doing something to them. There is hope I am an MD who had multiple food allergies including wheat, nuts, dairy, and other foods. I took allergy shots without apparent benefit. Several years later I discovered and learned several therapies that cured allergies. I am one of many practitioners who have helped people get over some pretty severe allergies including asthma, rashes and anaphylaxis. Since it is not conventional medicine, confirming the clearance of the allergy needs to be done under a physician's supervision for safety reasons. Being allergy free or being able to not only tolerate foods,but also benefit from their nutritional value allows you to live more freely and safely. Being able to take a breath for life without reacting to innocuous scents and feeling you are being attacked and need to fight for your life is a realistic goal. food allergies My son is 26 now but when he started school it was overwhelming! He has peanut allergy, dairy and many lesser allergies. He carries an Epi-Pen hopefully ALL the time. He can have dairy now but the peanut never goes away. A freilichen and SAFE purim Everyone should have a SAFE and happy Purim. Aliza, it will get easier through time. I wrote this 2 years ago and I can honestly say each year it has gotten easier. This year after megillah we smelled something funny and realized it was sesame. We quickly told the kids, get your coats on. Not a single kid argued. No need to take a chance since we don't know if they are as well airborne ana. to sesame. They came home and we have had a wonderful night. Its just life now. As well, people are getting more comfortable. I got a number of emails this year asking what was safe for the kids. Their friends want to send them something and are telling their parents to contact me because they don't want to make their friend sick. thank you The article was very well written, it made me cry, bc I too am going to face my first real Purim, with the same issues. I am scared, petrified, and nervous, about the outcome. We will be stocking our pockets with benadryl and the epi-pens, along with his own nosh. He will be Winnie the Pooh, and will have a sign on him, "please do not feed the animal, petting zoo only! "- hope everyone gets the point! Purim is harder then Pesach My 5 year old is allergic to eggs, dairy and peanuts. When people hear that they say "Pesach must be awful for you! What do you eat?". My answer is Pesach is simple - he can, eat meat, potatoes, veggies and fruit (and the rest of us don't suffer from not having the other stuff). It is Purim that I dread. Just yesterday, we received our Shaloch Manos package from the day school. We put out two bags - one bag is of safe food and one bag is of unsafe food. We'll be dividing all the packages that come in that way; and it breaks my heart when my son's face falls as I put in that yummy looking candy that he cannot eat. I am compelled to take it a step further if I may. I suffer with food Allergies, Anaphylaxis and MCS (Multiple Chemical Sensitivities). There is no cure for any of these other than STRICT Avoidance. The world is not very friendly to people with MCS. One whiff of Bounce, Perfume, Febreeze, Glade Plug In's or other chemical/fragrance has the same effect as one Peanut would to a suffer with Peanut allergy. Incredibly, most people get offended & definsive if I tell them that their "Perfume is Literally Killing me" instead of trying to accommodate this invisible disability. Hence, with this lack of compassion, we are driven further and further into extreme isolation. Nobody seems to be able to live without their fragrances ... and yet people like me are being forced into isolation in epidemic proportions.